Helmholtz Chamber Design Means Max Fun. Gains 8hp in independent magazine tests! WHY: Because YOU want to have fun! HOW: Helmholtz Technology in a Miata Muffler for the First Time! WHAT: A 2016+ Miata Muffler that you can control, aggressive throaty burble fun when you want with wide open throttle, and super mild when you want to just cruise. CLICK HERE to see the full article covering our SuperStreet muffler. This muffler gives your right foot lots of control over the volume. The effect of the Helmholtz is very frequency specific such that under decel it can get mild and quiet, yet when you push hard toward redline it sounds exotic and racy. With the top down lots of fun throaty burble, but dramatically more tame when the top is up. In brief, FUN when you want it, and mild when just cruising. How did we do it? We outfitted our 2016 with a computer and sound analyzer and microphones and drove it under varying conditions and loads with and without muffler. We then use that data and some special software to calculate the particulars of the Helmholtz chamber to precisely knock down the frequencies we do not want to hear in the car while allowing the good throaty burble fun sounds to pass through. All this in a muffler under 14 pounds, a nice savings over the 21 pound factory muffler. Ride Along with our RoadsterSport Super Street in a Launch Edition owned by local customer Mark Booth below, big thanks to Mark for the great video! SHIPPING NOTE...ships factory direct to you. All POLISHED stainless steel construction. Uses stock hangers and connects to either our RoadsterSport midpipe or the stock midpipe. The SOUND level is Adjustable by YOU, INCLUDES removeable cone baffle insert in the tip that helps YOU select final sound level, baffle in for reduced sound level, and baffle out for more sound...and just one bolt under the tip to make the easy change. Sold separate is an optional packed baffle that cuts the sound a little if you want...but most won't! Proudly made in the USA...with a LIFETIME WARRANY! BRIAN'S APPLICATION NOTES: Famous Miata Racer Andy Hollis recently did his own dyno tests of this muffler and found it flowed as well as no muffler at all, with solid HP gains over the stock muffler, and he added: "BTW LOVE the sound!" Andy's dyno sheet reprinted on page 24 of our forum ND development thread. 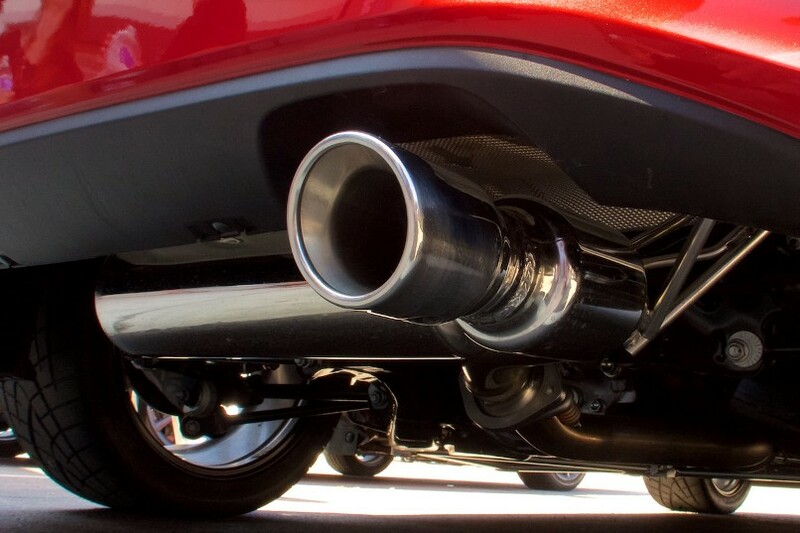 Our Race and SuperStreet Twin Tip share the same straight pipe design with result they will make the same horsepower gains, but this is the customer top choice on sound when used without baffles. Mild when cruising on otherwise stock ND, delivering a classic sports car BARK and THROATY RUMBLE when you wind it out to redline, lots of fun burble when just playing with the throttle around town. Result is TONS of fun, will make many of you laugh out loud. You also get the best performance from the straightest and cleanest flow out the exhaust cutout you can get, and much lower weight. Nonetheless, this choice is NOT for the faint of heart!!! The most common question we will get on this one is: "will it be too loud" and we cannot answer that one for you because the "right" sound level is a matter of entirely subjective personal preference. Our experience is that owners of Automatic transmissions prefer any of our SuperQ choices. This is an aggressive sounding muffler for those who like to go for the redline often! If our RoadsterSport SuperQ is 10 to 15% more sound than stock (depending on use of removable baffle), and our ND RACE is a full 50 to 55% more sound than stock when on throttle, and this ND STREET is the middle choice at about 35% over stock sound level when on throttle hard, though perhaps just 15% over stock when cruising home in high gear and low rpms. Works well with stock midpipe and our RoadsterSport midpipe, NOT for customers adding a header (see our SuperQ for Header). INTERNATIONAL SHIPPING NOTES: We only ship to USA and Canada but we do have dealers outside the USA. CUSTOMERS IN EUROPE CAN GET THESE IN EUROPE AT THIS LINK! Super Street leaving the line at SCCA Autocross event. Easily UNDER our local SCCA sound limits on otherwise stock Miata (our SCCA limit here is 93 db at 50 feet and even in the rain our testing found it easily under our strictly enforced sound limits). Also easily under the most strict 92db days at Mazda Raceway Laguna Seca when used on otherwise stock ND. Beautiful piece of equipment that also saves weight. The single exhaust tip looks great and the sound is slightly more decibels than stock but the tone is much better. I recently had the RoadsterSport SuperStreet exhaust installed on my 2016 MX-5 Club. Previous to the installation, I removed the sound tube from the vehicle so I could get a good baseline of what the new exhaust added to the motoring experience. Without the sound tube, the engine note was barely perceptible. Gadzooks! With the SuperStreet - the car blossomed into a complete fun machine. Now the "go fast" pedal produces an auditory effect that immediately clues you into the attitude of the car. Cruising? - nice and relaxed sound. Hot-shoeing? You know it baby! And that is with the baffle still installed. The upgrade to the motoring experience is tremendous. Not only do I hear it, but I can feel the exhaust vibrations in the chassis as I blast about. I also perceived a little bit of a kick in the pants in the higher rev range that I did not perceive before. It is a very rewarding and exhilarating upgrade. Well worth the cost and I look forward to many fun miles ahead. Oh - and the craftmanship and quality of the muffler are second to none. Once again, Good-win has provided a cost-effective and rewarding upgrade to my vehicle. This was the first modification I made to our MX5. I read all of the other reviews and watched all the youtube videos prior to buying. All I can say is this exhaust sounds incredible. Just the right tone, and growl. It makes driving the car even more fun than stock. Installation was a breeze and I didn't even have to lift the car. Did it right in my driveway. The finish quality was extremely high and the polished metal looks beautiful. Definitely recommend this exhaust for sure. This is the first mod I did on my 2017 RF. I actually got the exhaust in a week before I was able to track down the Club model I wanted. With less than 200 miles on the car I had the exhaust and mid pipe installed. WOW!! Like...really..the amount of fun this exhaust adds is amazing. A nice throaty burble at start up..never intrusive, and a complete joy to listen to with the top down. For me, this exhaust has been the perfect addition. Not too loud...but loud enough to paste a smile on your face when you're rowing through that sublime gearbox. I cannot recommend this exhaust highly enough!! Just do it....you won't regret it. Oh..and I just put 10,000 miles on my RF which is my daily driver..and the exhaust just gets better and better! Close to the perfect balance of noise level and tone for a street car. The removable baffle makes it slightly quieter and is nice to have. Easily removes with one bolt. This exhaust doesn't make any bad sounds at any rpm at any throttle %. The tip looks great as well. I love this muffler. It's used strictly on the street and gives me the not too loud and not too quiet deep sound that I like. Easy install in my driveway was a bonus. At age 62 I sometimes think that I should have grown up by now but I still like a "just right" exhaust note. Really easy to install and sounds awesome. Can't really say I feel the little bump in horsepower, but I've only had the car a couple weeks and my internal dyno isn't too accurate. Install was super easy. hardest part was getting the stud out of the old muffler. The sound is almost exactly as described and if you add the baffle, it's downright cruise ready. Wanted to upgrade the muffler because I was tired of hearing nearby accords and camarys over my MX5. Went for the SuperStreet because I wasn't sure how loud the Race version was going to be. The SuperStreet sounds perfect to me. It's not the muffler that is going to make your neighbors come out of the house, but it's still pretty loud. Install was easy. I wrapped the end of a breaker bar with a soft rag and used it to pop off the soaped up rubber hangers easily without scuffing anything under the car. As far as the long bolts go, I just pulled the old muffler off with them still attached, hit the base with a little WD-40, let it sit for a couple minutes, and they popped right off. I had to use a deep 1/2in hex socket on mine. The 13mm was too big and rolled over the already rounded corners of the bolts. Could have been my tools though. Great product! Sounds perfect and I'm sure it adds a couple of ponies as well. I can't verify the gains claimed via the dyno as I installed this muffler with only 37 miles on the clock and have nothing to compare, but it is worth every penny just for the sound, build quality and weight reduction. Now that I have an OFT tune the car is definitely quick, so the two in combination are working well. Kudos to Brian for continuing to develop products and support the Miata (and Fiat) platform.